Cape Breton Tourism Spotlight: Velo Cape Breton Association's "Ride Into the Past" Historical Tour to Kennington Cove, Takes Place on October 10th. Velo Cape Breton Association's "Ride Into the Past" Historical Tour to Kennington Cove, Takes Place on October 10th. Attention all cyclists! 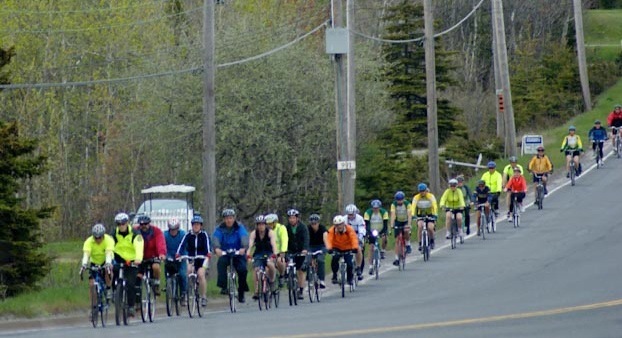 Velo Cape Breton Association’s Ride Into the Past - Historical tour to Kennington Cove will take place on Monday, October 10, 2016 starting at 10:00am. The starting meeting will take place at the Royal Battery Parking Lot in Louisbourg. ‘RIDE INTO THE PAST’ will have 6 stops to Kennington Cove. An 16 km historical ride at the FORTRESS of LOUISBOURG National Historic Site. This ride is an historical bicycle ride for all rider capabilities. ## 10 AM registration - $10.00 (cash only) is under the VELO Canopy at the Royal Battery Parking lot (about 300 metres on the main road to Gate/Porte 2 just past the CLOSED main gates to the Park). ## 10:30 is the expected start of the tour. ## Drive to Louisbourg Canada Parks Royal Battery (about 300 m past the Visitor Centre Gate. ## A Velo Cape Breton canopy is here and registration is at 10 AM. ## The cost is $10 and proper change is needed please. ## This is a 16 kilometre ride with 5 stops having historical information on primarily, a great dirt road. - hence ‘Racing slicks’ are not recommended. ## If it is wet, appropriate footwear may be required to access Wolfe’s Monument/Cairn at Kennington Cove. Eliot Frosst will be your guide in a JEEP and follow the group. Jimmy Campbell (on bike) will be your Velo Cape Breton Ambassador and be on bicycle leading the way. You can leave articles such as cameras, water, sweaters, etc.in the Jeep and these will to each STOP. START - Talk and start - Why was the Royal Battery important in both sieges (1745 & 1758)? Royal Battery or into the Fortress with stops at BLACK ROCK and the QUEEN’S Gate. After visiting the town site one can leave by bicycle through the Dauphin Gate. For more information, please contact Eliot Frosst via efrosst@hotmail.com or at 902-674-0936.